During the winter, Simon Richardson, our talented co-ordinator and fledgling nurseryman, has been busy making up small bags of poppy seeds which have been mixed with dry sand, to make sowing easier. The seed variety used is that of the Flanders Poppy (Red Corn Poppy) papaver rhoeas. Free packets of seed have been delivered along with a sheet of useful, easy-to-follow instructions. Theoretically, we are well into the sowing season; however, adverse weather conditions have knocked this back. A prolonged spell of clear, cloudless skies and plenty of warming sunshine will soon get these tiny seeds started. Surviving in far better conditions under cover and indoors is a population of plug plants. They are being ‘grown on’ for planting out in borders and containers during the summer. Matured plug plants will be distributed for planting out when the risk of frost has passed. You don’t have to be on any list to become involved in the Turn the Village Red campaign. Anyone can have a go at making individual displays in tubs, pots, hanging baskets, garden borders or, in the case of poppy seed, scattered directly on prepared ground. In Remembrance, let’s grow together. A new cottage industry took root on Saturday 24th March when 80 eager poppy making petal pickers popped into the old Grammar School Room to artfully transform piles of paper bowls and plates into an astonishing floral display. Before hand, each plate and bowl had been skilfully painted on both sides in a delectable red. You can imagine the scene as almost every flat surface in designated domestic interiors was covered by screes of red discs, settling like ash from an erupting volcano. It looked as if a new board game had suddenly caught on. Weeks before, Phil Irwin had sourced the paint, Wilko’s finest “Nearly Famous”, and tested its durability. Surprisingly, painted paper poppies comfortably survived intact two weeks of ravaging Rolleston rain. By the end of the day, 488 individual blooms had been artfully created on this non-stop assembly line. Remarkably, the coming and going of people throughout the day did not appear to affect output. Each happy shift kept the momentum going, with little slack in the system. Even the pleasant distraction of a mid-day wedding, with church bells ringing and smartly suited interlopers, did not interrupt the flow. The atmosphere in this friendly workshop was very special indeed. Working in this vibrant community of skilful artisans was truly uplifting. It was wonderful to be part of this happy, mixed-age workshop. On average, each person made 6 poppies. By our calculations, these will go a long way towards meeting the total required for the Rolleston Remembrance Cascade. Before being artfully draped from St Mary’s Church Tower, each poppy (many bearing the name of their maker) will be carefully positioned and then attached to netting. This fabulous catch will be hoisted in place, stretching from the tower battlements above to the ground of the churchyard below. 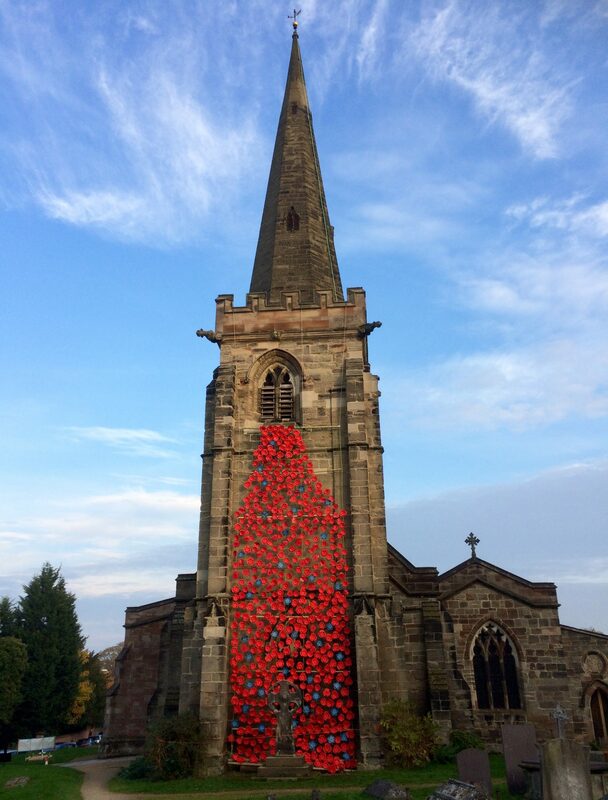 Thank you to all who supported this event; by cutting, stapling, bodging, sewing, painting brewing and serving you helped to bring Rev Ian Whitehead’s vision of a Poppy Cascade closer to realisation. Your fantastic response exceeded the wildest expectations of a truly grateful RoDSEC team. Poppy making on an industrial scale!